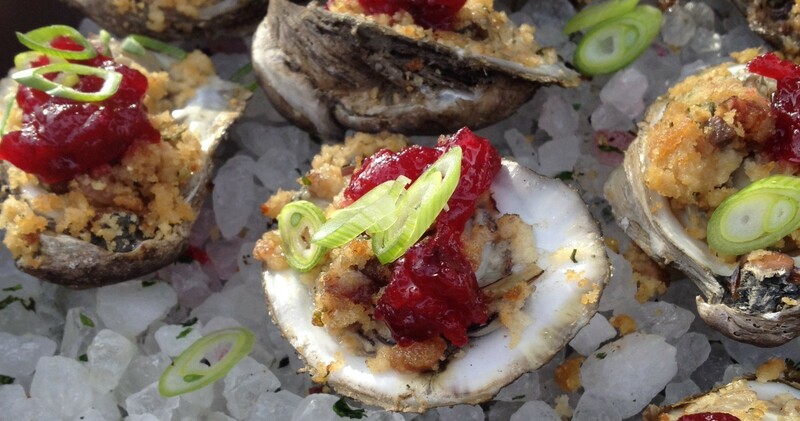 Chef Jim Smith’s “Cajun Thanksgiving” oysters, grilled with duck fat cornbread dressing and topped with cranberry sauce and scallion. ⭐️Jim Smith’s Oyster and Sausage Dressing. You need to know three things about this cornbread dressing recipe: oysters, Conecuh sausage, duck fat. It’s one of the best dressings I’ve ever eaten (and I ❤️ dressings and stuffings). My mouth waters every time I think about it. Smoked Oyster and Bacon Stuffing from Martha Stewart. This recipe for stuffing with smoked oysters makes enough to stuff the bird and have a small pan of dressing. Miniature Oyster Patties. If you need a hit of oysters on turkey-day, but some people don’t want oyster dressing, get rid of those people. You don’t need that kind of negativity. OR make these yummy, one-bite oyster patties from Raised On a Roux. Oyster Stuffing with Shiitake Mushrooms and Leeks. Marni at Love and Duck Fat gives traditional oyster stuffing a tweak, adding shiitakes and using leeks instead of onion. Red Hot Oyster + Kimchi Dressing. Mandy Lee at Lady and Pups created something extraordinary in this recipe for her very first Thanksgiving dinner. I can’t wait to try it! ⭐️Creamed Spinach Oyster Stuffing. If oysters Rockefeller and classic turkey stuffing had a baby, it would be this super rich recipe from The Rachael Ray Show. Biscuit, Bacon, and Oyster Stuffing. Biscuits! Not cornbread, nor French bread, nor white bread. This stuffing recipe from Pink Parsley starts with biscuits. Sounds like a must-try to me. Creamed Oysters in Acorn Squash. This impressive (and easier than it looks) dish will get a “WOW!” from your Thanksgiving guests. You can use this creamed oyster recipe from Southern Living or serve your family’s favorite creamed oysters in baked acorn squash. Oyster and Rice Dressing. In 1987, Mississippi natives, Craig Claiborne and Lee Bailey, decided to gather five of Natchez’s best cooks to prepare a southern Thanksgiving feast. One of the dishes was this traditional rice-based dressing, loaded with oysters. Read Claiborne’s full account of the meal, “Comforts of a Southern Thanksgiving“ in the New York Times archives. Andy Benson’s Creole Oyster Dressing. Jyl Benson inherited oyster dressing duty twenty years ago. She shared her father’s dressing recipe, a “taste of Creole Nirvana,” with Louisiana Kitchen & Culture. ⭐️Lucy Buffet’s Oyster Dressing. This one is consistently a favorite with the Oyster Obsession Facebook group! In 2015 about thirty members made it for their Thanksgiving dinner. Herbed, Alabama Gulf Oyster Stuffing. This one uses all fresh herbs, so you know it will smell like heaven. Have you picked out your oyster dressing for Thanksgiving yet? Oyster and Bacon Stuffing. Thanksgiving is only weeks away. Have you chosen your oyster dressing yet? Consider Real Simple‘s take on this traditional New England recipe. ⭐️Oyster Stuffing Cakes. Oh My God Becky, look at this recipe from chef Peter Woods at Merroir! 1. If you’re hosting a small Thanksgiving dinner, this would be a fantastic presentation. 2. Oyster stuffing leftovers will never be the same at my house. 3. There’s a Bacon Scallion Cream Gravy to ladle over this pattied perfection. ⭐️Smoked-Oyster-and-Andouille Dressing. I got to taste this cornbread dressing from Mary Catherine and Drew Curren in the Southern Living Test Kitchens. The combo of smoked oysters and a little smoke and heat from the andouille is wonderful. Oyster and Cracker Dressing. How’s Turkey-Day meal planning going? This old-fashioned, saltine cracker dressing, loaded with oysters, comes from Martha Stewart. Gramma Byrne’s Scalloped Oysters. Chris Nelson at Bon Secour Fisheries shared his grandmother’s recipe for this buttery, creamy celebration of oysters. The description at Alabama Seafood calls it “a savory seafood cobbler.” That’s my kind of dessert! Southern-Style Scalloped Oysters. Paula Deen knows buttery, creamy goodness and this simple recipe proves it. Leaving me alone with these in the house would come to nothing but trouble. A whole lot of buttery, creamy, briny trouble. Oyster Casserole. Zach and Clay at The Bitten Word decided to make this scalloped oysters recipe instead of an oyster dressing for Thanksgiving. Yum. Big Easy Oyster Dressing. Susan Benton at 30AEats shared this recipe she learned while living in New Orleans. Did I mention the bacon, and shot of Crystal hot sauce? They’re in there! Chef Edward Lee’s Cornbread Oyster Dressing. Edward Lee, chef at 610 Magnolia in Louisville, shared his oyster dressing recipe with Garden & Gun. Surprise ingredient? Roasted chestnuts! Read the recipe to see why. Ruth Fertel’s Plaquemines Parish Oyster Dressing. Ruth Fertel founded Ruth’s Chris Steak House. Her son shared their family’s oyster dressing recipe with chef John Folse. The 20-serving recipe includes a GALLON of oysters, two pounds of sausage, a dozen eggs and more than a pound of butter! If you make this one, I want pictures. Oyster Dressing “Grand-Mere.” Before Oyster Obsession, I would have rolled my eyes at a spicy dressing recipe, but oysters love the heat! With cayenne, hot sauce, and paprika, chef John Besh’s recipe is a perfect marriage of spice and brine. Emeril’s Oyster Pie. Joey Stanga’s talk of oyster pie encouraged me to go ahead and post Emeril Lagasse‘s recipe. Yum! This recipe originally appeared in Emeril’s classic cookbook, Emeril’s New New Orleans Cooking . The BLT Oyster Stuffing from Bon Appétit Magazine. That’s Bacon, Leeks and Thyme. And of course, 3 cups of OYSTERS! Baked on The Oyster Bed, Adam and Tommy Waller’s innovative oyster tray, the recipe for Mim’s Oyster Dressing produces individual oyster dressing bites! Get ready to fall head over heels if you like your dressing a little bit crusty and crisp. Don’t forget the leftovers! Smoked Turkey and Oyster File Gumbo is the best thing that ever happened to leftover turkey. Vince Camillo at Cooking Channel makes this easy, rich gumbo in just over an hour with three cups of smoked turkey and a dozen oysters. Need more Thanksgiving oyster recipes? Get dozens of the best oyster dressing recipes from your favorite magazines, cookbooks, chefs and food blogs. Think that if you’ve tried one oyster dressing, you’ve tried them all? Not with this variety! We’ve got recipes for rice oyster dressing, cornbread oyster dresssing, crabmeat oyster dressing, oysters Rockefeller stuffing, oyster stuffing cakes, smoked oyster dressing, oyster biscuit dressing and more. Thanks for sharing my Miniature Oyster Patties recipe Jason! I’m thrilled to have discovered this amazing site! Eat more oysters!! Thanks for including 30A Eats on the list of so many other fantastic recipes! Looking forward to trying many over the holidays!